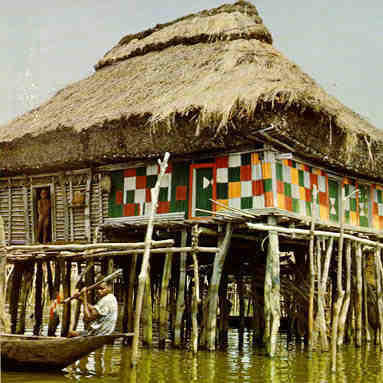 Ganvié the "Venice of West Africa"
The architecture of most West African below sea level mangrove villages is dominated by buildings on stilts or poles. 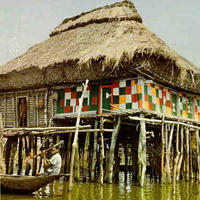 One of the most notable is the town of Ganvié, Republic of Benin, referred to by some as the "Venice of Africa". Eco-architects looking to build in these locales can learn from the negligible environmental impact of the existing indigenous structures,and the successful incorporation of local materials. A unique aspect of these buildings in the West African context is the extensive use of bamboo, zinc roofing is where it exists a poor substitute for traditional straw thatch . The vernacular and the post modern(as shown in the ING hq) both have the common purpose of keeping the inhabitants in this post-Katrina world high and dry.